Here are the socks that I started on the train to Seattle, and worked on intermittently while waiting in lines and whenever I had a few spare moments. It’s amazing how those little minutes here and there really add up! I was up to the gusset increases when I got back. 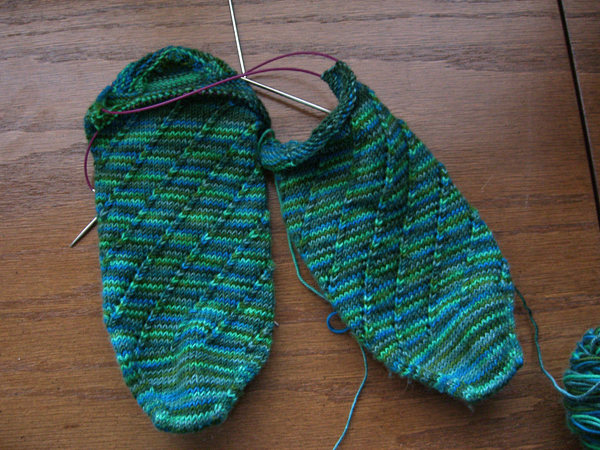 Since then I’ve finished the gussets and I’m in the middle of turning the first heel. This is STR in colorway County Clare. The pattern on the top of the instep is a simple K2tog/yo/k6 pattern that moves one stitch to the right every round. No, those are not my regular trusty Inox Greys. Those are a pair of the new Knitpicks needles – the “classic” circular needles (i.e. ones with fixed cable joins). What do I think about these needles? Hmmm… The jury is still out. I love the cables. The cables are just simply awesome and I can’t say enough about them. And the joins are very good. Certainly the points are sharp. And the length is good. I didn’t find the length at all annoying going through the gusset increases. But there’s just something… I find myself splitting the yarn a lot, which is not usual for me. And sometimes there something on the tip that snags, although I can’t find any rough spots. They’re not as “fast” as an Addi. But faster than wood. I don’t know. These are a size US#1 (2.5 mm). I might try a size 0 (2.0 mm) and see if my hands can take it or if my fingers get too sore. Certainly the price is right for that kind of experiment. I will report back. Lori Rode – my new shoes were made by Ecco. I got them at The Walking Company store at Washington Square. If you haven’t shopped there, I really recommend them. They’ve got a ton of comfortable shoes of all styles. Stephanie – How are the socks coming? Did you get that heel turned? Deb – There’s a Lush here now? That’s dangerous!